Yes, this is our booth at the MWC in Barcelona. It was packed! 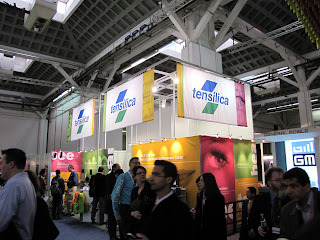 Great show for Tensilica. Lots of important meetings and an opportunity to meet a lot of new people with creative ideas for next-generation smart phones. Our ConnX Baseband Engine and demo with mimoOn was a particular draw for the crowds. Sometimes it was hard to clearly hear the audio demos because it was so busy.